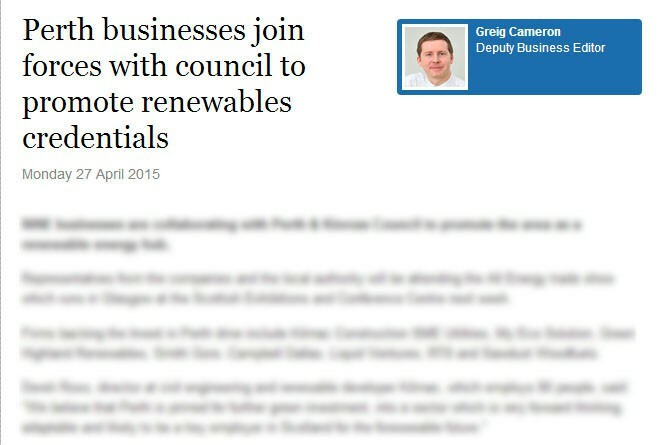 With the help of PR agency in Edinburgh, the press turn their attention to an innovative council campaign which strives to transform Perth and Kinross into the most prominent region for the renewable energy sector in Scotland. Perth and Kinross council initiative, Invest In Perth, are in collaboration with nine Perthshire businesses, making this partnership a powerful driving force to promote the area to industry leaders in the energy sector for investment. Award winning PR agency in Edinburgh collaborates with Invest In Perth and shares this story to local and online press. The story achieved coverage in Business Quarter, a leading business to business publication well-known for celebrating entrepreneurship and corporate success. It was also featured in their influential Scottish newsletter, which reaches out to 7,099 subscribers and is targeted at influencers and industry leaders such as CEO’s. But the coverage did not stop there. The interesting story was picked by The Herald, which has a circulation of around 43,157, as well as Th e Courier -a regional compact newspaper – with a circulation of 53,243. The story also made its way online, successfully featuring on the Tayside Business News. Edinburgh PR agency, Holyrood PR work with Invest In Perth to share their success stories generating high exposure in key national publications and business networks. Find out how Scottish PR in Edinburgh can raise your business profile. If this story has inspired you or need a hand capturing media attention, call us now on 0131 561 2244 or fill out the form below.